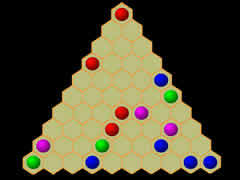 Game is carried on the triangular field consisting of cells of the hexagonal form - "cells". The quantity of cells in the lower row depends on the level of complexity and can be 10 or 11. Each cell, except being on the edge of a field, has 6 neighbors. The player and the computer walk in turn. The first the computer walks and exposes in angles of a field of 6 multi-colored full-spheres. Further, in case of each course the computer in a random way throws out on the free cells of a game field of 3 color full-spheres. The player can move any full-sphere on the empty seat if there is a way from the initial full-sphere to a terminal point. The task of the player is compilation of certain figures from full-spheres for which he receives points. If in case of the next course the figure is formed, it is removed from a field, and the player acquires the right to move one more full-sphere, etc. Game comes to an end when all cells of a game field are busy.